Appalachian Crafts began as a means by which the folk potters of North Carolina could have an outlet for their work in Western North Carolina. We still carry potters from Seagrove, NC, the main center for NC folk potters. 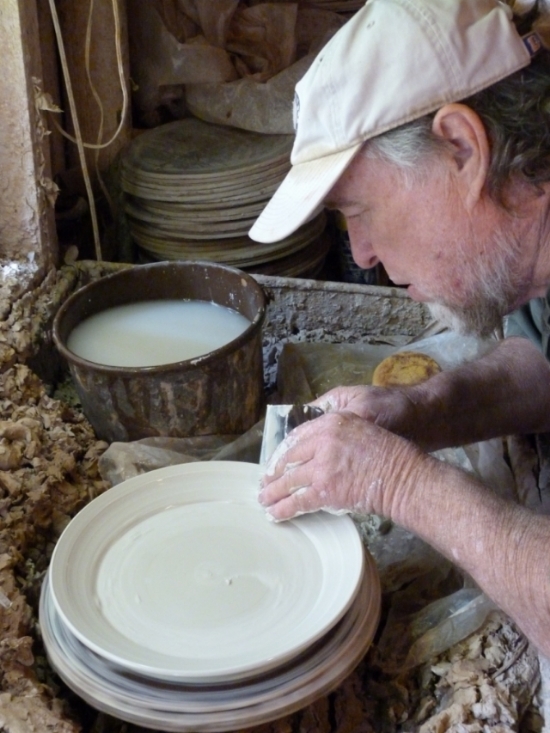 Above is Boyd Owen of Owen's Pottery, Seagrove, NC. Our store is also in an area filled with talented potters. We have incorporated many of them into our shop to make your shopping a varied and interesting experience! We carry a variety of beautiful earrings, necklaces, and bracelets at both the main store, Appalachian Crafts, and at Appalachian Crafts Too, our store in the Renaissance Asheville Hotel. SALAD TONGS IN WALNUT AND OAK. Our wood crafted items are from several dedicated craftsmen and women in the Southern Appalachians. Salad Hands, toast grabber, cheese holder, and scoop. Our quilts come in all sizes, patterns and colors-and the choices can be yours! Our quilt maker is in her eighties yet still hand quilts each one. Each quilt is an heirloom. OTHER ITEMS OF INTEREST: Toys, and a beautiful floor lamp.